Find great prices on self dumping hoppers, a Gaylord box dumper and a trash can dumper at Nationwide Industrial Supply. We have a great selection of steel dump hoppers, forklift trash hopper and stainless steel dump hoppers and Vestil Dump Hopper for all of your material handling needs. A forklift dumpster, steel hopper, tote dumper or metal hopper makes material handling and dumping of bulk materials and waste easy. Nationwide Industrial Supply offers top quality metal dump hoppers, low-profile dump hopper, box tippers, trash can dumpers and plastic dump hoppers at great prices. Food Grade 304 Stainless Steel Dump Hoppers Available. CALL 800-757-1064 TODAY FOR QUANTITY DISCOUNTS AND LOWEST FREIGHT RATES! 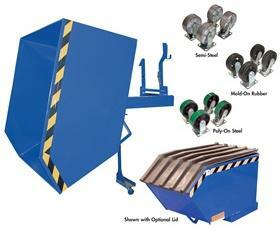 Our Dump Hoppers and Stainless Steel Dump Hoppers make material handling of refuse and other raw materials easy. These rugged dump hoppers start from 1/4 Cu. Yd. to 5 Cy. Yd. with from a 2000 lbs. to 5000 lbs. Cap. From 1/4 Cu. Yd. to 5 Cy. Yd. with 2000 lbs. to 5000 lbs. Cap. Quantity discounts are available for dumping hopper units. This Gaylord box dumper and Tote Dumper has advanced features from solid steel construction to the Emergency Brass Velocity fuse in the cylinder. Main components of this box dumper: a 24V hand held pendant control, 56 frame motor, and upper travel limit switch to reduce wear on the components. Safety features of the industrial box dumper include side rail guards, floor hold down brackets, adjustable hold down bar, 3,000 psi hydraulic component rating, and an integrated brass velocity fuse mounted inside the cylinder. This box dumper has a 2000 to 6000 cap. making it perfect for many material handling needs. It is painted Royal Blue. Our Gaylord box dumper can also be customized. Plastic Dump Hopper unit dumps using the pull handle. Tilt truck lids fit these light, easy-to-use self dumping hoppers. Optional caster assemblies also available. (Request model # with casters when ordering.) The dumping hoppers are available in the following colors: Gray, Blue, White, Red, Green, Yellow, Black or Orange. 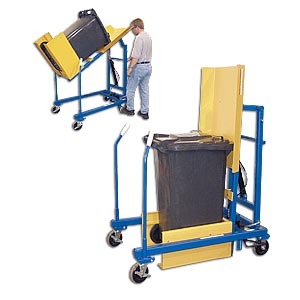 Plastic hoppers make a great material handling tool as they are light, quiet and easy to handle. The low profile design of these dump hoppers is essential for convenient loading and dumping. Operating this industrial dumping hopper is quick and easy. A cable runs up to the driver and with a simple pull the unit dumps. Then the steel hopper returns to a locked position when lowered to the ground. Fork pockets on this material handling equipment measure 7-1/2" x 2". 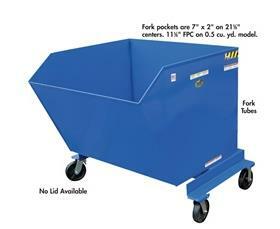 The dumper has a durable powder coat finish. Optional casters and lids are available. Our self dumping hoppers make material handling easy. 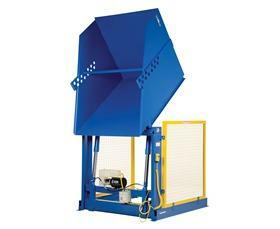 This portable steel hopper dumps, returns to the upright position and locks, ready to reload. Fork truck entry tubes make dumping from this industrial hopper into large containers easy. A foot operated caster lock is included. The material handling equipment rolls on 8 x 2" phenolic wheels. Weight capacity is 2000 lbs. 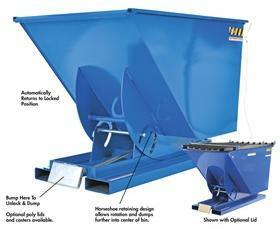 VESTIL DUMP HOPPER WITH BUMPER RELEASE STEEL HOPPERS: 2000 to 6000 (lbs) Cap, 1 to 3 Cu. Yds. VESTIL HYDRAULIC TRASH CAN DUMPERS: 48" Dump height with 400 (lbs) Cap. These trash can dumpers are available in manual foot pump or DC powered operation with hand control making them a very useful piece of material handling equipment. Both dumper styles have heavy-duty steel construction with 2 rigid, 2 swivel casters for portability. The industrial trash can dumpers have a 400 lbs cap. What is a Dump Hopper: A dump hopper is a container used to temporarily store materials so that they can be dumped easily. Metal Dump Hoppers are used in construction, warehousing, agriculture and other material handling industries to process, dispose of or relocate materials. Some self dumping hoppers or trash hoppers attach to forklifts. They usually operate by picking up the raw materials or refuse, automatically returning to an upright position and locking so that they can be reloaded. Steel Dump Hoppers are categorized by volume capacity, weight capacity, depth or length, width or diameter, and what they are made of. The versatility, dependability, and variety of self dumping hoppers and trash hoppers make them an essential component for any worksite dealing with large, often unmanageable, material. At Nationwide, we feel self dumping hoppers (also known as forklift hoppers) are the most useful and practical type of hopper. 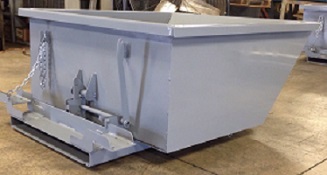 Dump hoppers come in a variety of sizes and materials, e.g., a Steel Dump Hopper and Stainless Steel Dump Hopper each offering different load capacities. 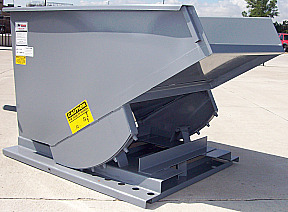 There are low profile dump hoppers for applications that require lower access. 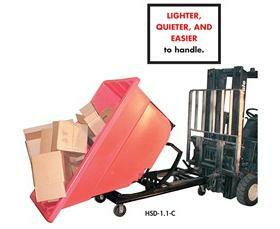 Many light duty hoppers have load capacities of 2000 lbs. Medium duty hoppers typically have 4000 lbs. load capacity. And heavy duty dump hoppers offer a 6000 lbs. load capacity. Other self dumping hoppers offer a bumper release option. There are plastic dumping hoppers, which offer benefits such as being quiet, light and easy to handle. Steel hoppers are much stronger, more durable and can carry heavier loads as a metal hopper. Some accessories for a self dumping hopper include lids and casters, which allow portability. Since trash hoppers vary based on how and/or what you want to dump, you should take all of your specific needs into consideration. A Dump hopper is commonly used for severe applications where a structural base is needed. The form of self dumping hopper is perfect for processing, scrap yards, heavy stamping and other heavy duty material handling applications. Low profile dumping hoppers are designed to meet height restrictions that standard hoppers are unable to meet. They are commonly used under work stations, conveyors and presses where space is limited. Bumper release dumping hoppers dump when the bumper release is pushed. They automatically return to the upright, locked position after dumping. There is usually a safety lock to prevent accidental dumping on this style of industrial hopper. To see a wide variety of our self dumping hoppers, and other accessories we have discussed, browse our online catalog here at Nationwide Industrial Supply. Also, please feel free to contact us at 1-800-757-1064 or email us at sales@nisproducts.com, and we will be happy to help figure out which application will work best for you and your business.